Nick, seen here at the Fuhrer Bunker, Berlin, bringing to life the last few days of Hitler and his entourage in the Bunker, graduated in Archaeology at University College London in 1989 and excavated widely in the Near East for nearly a decade. After a research post at Cambridge University he made Berlin his home, becoming one of Berlin’s foremost English language guide lecturers on modern Berlin history. A qualified authority on KZ Sachsenhausen, guest lecturer at Stanford in Berlin and a long term active member of the Berliner Unterwelten eV. documenting and researching Berlin’s underground history, Nick has divided his research time between Berlin digs, exploring Nazi bunkers, travel journalism, touring the city and lecture tours on the Eastern Mediterranean. Nick has recently worked on historic TV productions with John Sergeant & Rick Stein. Not many have the ability to have an audience hang on their every word but it can be truly said that when guests are exploring Berlin on one of MHT’s tours with Nick leading the way guest’s will truly feel they have been taken back in time. Whether it be running through the last days and hours of Hitler’s life at the Fuhrer Bunker or reliving Bormann’s breakout dash down into the flooded subway system guests will be fascinated as they get to touch and experience this incredible period of history. It’s easy. 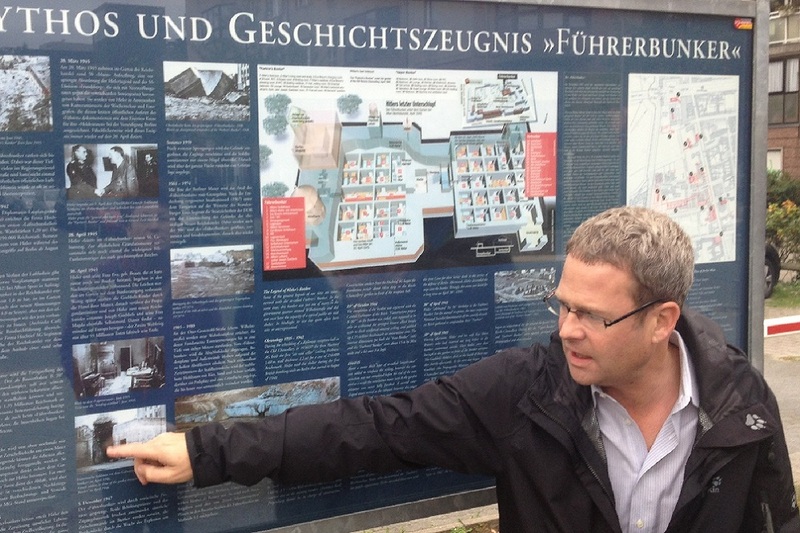 Many interested people come to Berlin and read the information board at Hitler’s Bunker site, pictured above. Only a select few, however, get to explore it with someone whose name is on it…. MHT’s exceptional organisational planning together with Nick’s phenomenal breadth and depth of Third Reich knowledge has led to what can only be described as an experience never to be forgotten.